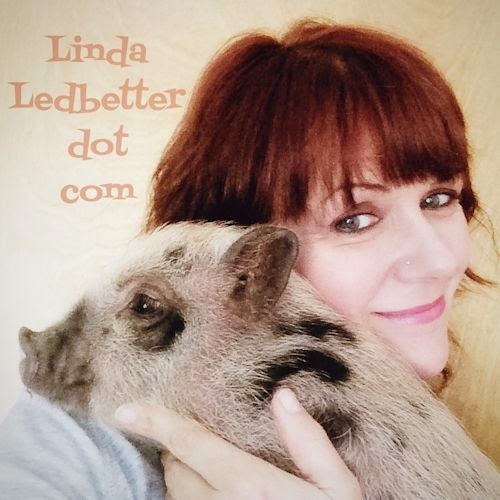 Linda Ledbetter is a mixed media crafter, photographer and blogger living in Boise, Idaho. She's Mom to three sweet kitties and one polka-dotted micro-mini pig, and makes her living as a barista and organic juice mixologist at her local food co-op. Her style is all over the map, from whimsical to girly to down-and-dirty grunge, and she's renowned for leaving a trail of destruction in her wake with each and every crafting session. She usually listens to 80s pop tunes and sips Very Strong Coffee when she creates, and is an admitted and unrepentant social media junkie. 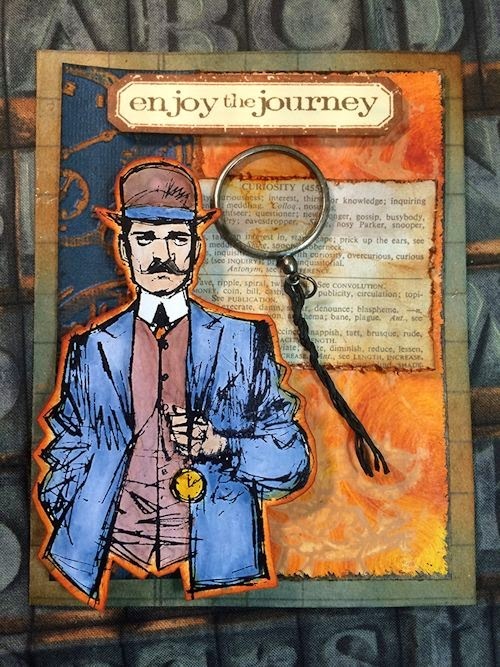 Currently, Linda's hosting "A Compendium of Curiosities 3 Challenge" based on Tim Holtz's latest book, and she really hopes you'll join in! She lives on the internet at lindaledbetter.com. Hi everyone! I'm absolutely thrilled to be included as a Guest Designer here at A Vintage Journey, and so appreciate the opportunity to spend time with you guys here among all these amazing artists! 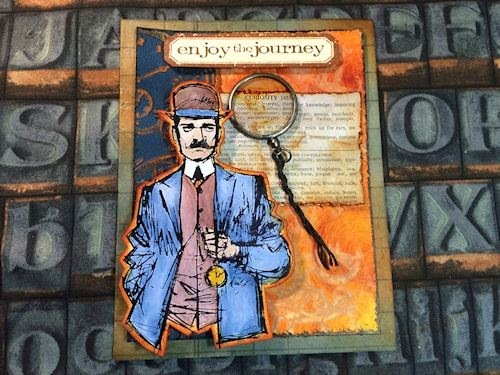 My project for the "All About Him" challenge was inspired by a couple of things: First and foremost, by Tim Holtz, who I credit for opening the crafting world to an entirely new way of approaching our art. There's such beauty and inspiration in the distressed, imperfect, DO-ABLE projects he shares, and for those of us who are somewhat cute-impaired, it's incredibly freeing to let loose and-- quite literally-- color outside the lines. I love his grungy, badass aesthetic. A gorgeous project Linda, colourful, creative, appealing and such a fabulously 'Tim' inspired piece. Thank you! We hope you'll join in with us in thanking Linda by visiting her at her home blog and sharing some blogster love with her! Our current challenge closes at 6pm on Thursday (Londom time) so you have until then to join in. Let us see what YOU can create! See you again on Friday - have a great week. Who knew blue and orange would work so well together on a masculine card - I guess Linda did! love this! Most awesome, Miss Linda. Very cool vibe on this man card. Love it! Wow, I absolutely LOVE this card, Linda! What a terrific image to work with too! The colors are fabulous! Perfect card for Father's Day! You are rockin it!! Love your card Linda - I always look forward to seeing what you create. You are always so inspiring and fun. Keep blogging and challenging us. Great card Linda! It reminds me that I need to be thinking of getting Father's Day cards done! Oh Linda, first of all I loved reading about you!! "Cute-impaired", now that's a phrase I will have to remember, as it's one I can so identify with!! 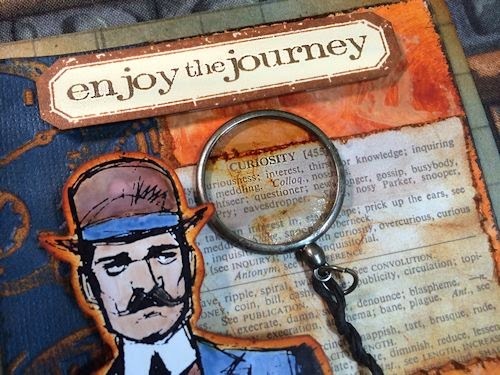 Your project is fabulous, love the glow of colour around the guy and the monocle is a brilliant touch!! What a fantastic project - those colours seem to actually glow... the fiery orange is amazing in the background, and I love his Readybrek halo! Wonderful to have you on board for this leg of the journey, Linda! Isn't this card amazing? I follow Linda's blog and agree she is fabulous. When I saw she was a guest designer on your blog I decided to drop by and say hi and I'm glad I did! Your blog is amazing and love all the beautiful inspired by Tim projects.I'm in the US so won't be entering any challenges but I'll be sure to stop back by for the inspiration.